"Ideal for couples or small families...has electronic temperature control for both the fridge and freezer sections, and LED interior lighting." "Top-rated model that costs thousands less than many popular modern refrigerators, perfect for smaller kitchens and families." "Energy Star-certified, top choice for families...electronic temperature controls, incredibly spacious and the interior is designed for easy use." "Energy Star-certified, sleek modern design with a factory-installed ice maker, as well as ample storage options." "Features wall-to-wall frameless shelves, two crisper drawers, adjustable door bins, and a Flexi-slide bin." "At 26 inches deep (24 interior), sits flush with standard counters and cabinets, features a full-width pantry drawer." "All the features you need, including the designated top-mounted freezer space, but it's significantly smaller than other models." "Mini-fridge has designated fridge and freezer space and vegetable crisper drawers, full-width shelves, door bins, and more." 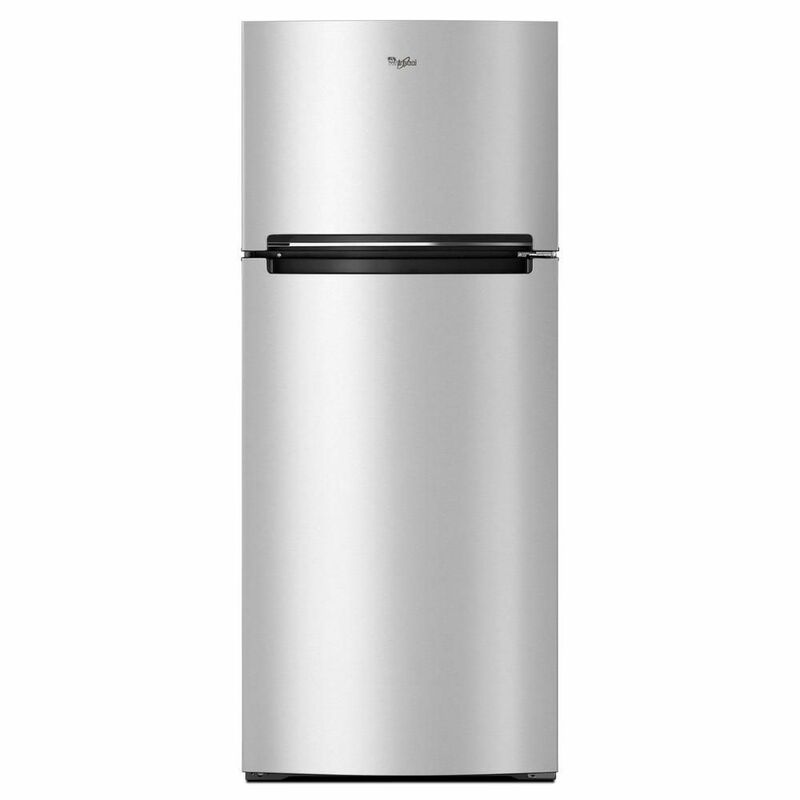 For a highly-rated top-freezer refrigerator that’s middle of the line both in terms of price and size, you can't go wrong with this product from Whirlpool. This model boasts a variety of convenient features, and its reasonable price tag won't break the bank. This refrigerator is 28” x 67” x 31” and has an 18 cubic foot capacity that can hold approximately 18 bags of groceries—ideal for couples or small families. The appliance has electronic temperature control for both the fridge and freezer sections, and its LED interior lighting ensures you will always know exactly what's inside. There's a Flexi-slide bin for custom storage options, as well as two crisper drawers and adjustable door storage. Reviewers say this top-freezer refrigerator is more spacious than anticipated and almost all agree it's a great value for the price. Several people said that their appliances were damaged upon delivery, but the manufacturer was able to repair or replace it. As mentioned, top-freezer refrigerators are incredibly affordable thanks to their simple design. You can even get one of these appliances for a couple hundred dollars—for instance, the Magic Chef 10.1 cu. ft. Top Freezer Refrigerator is a top-rated model that costs thousands less than many popular modern refrigerators. This top-freezer fridge is 24” x 60” x 26”, with a capacity of just over 10 cubic feet. The capacity is on the smaller side, so this is probably not the best appliance for large families, but it's perfect for smaller kitchens and families. The interior includes a crisper, adjustable shelves, an in-door can holder, and a wire shelf in the freezer. You can control the temperature with the adjustable electronic temperature control system, and reviewers say this is a great small refrigerator that comes at an unbeatable price. If your budget is a little bigger, you can get a modern, spacious top-freezer refrigerator that will serve your whole family well for many years. The LG Electronics 23.8 cu. ft. Top Freezer Refrigerator is pricey (especially for this style of refrigerator), but it's still thousands of dollars less than other styles. This appliance is 33” x 68.5" x 33”, with an impressive 24 cubic foot capacity, making it a top choice for families. In addition to electronic temperature controls, this refrigerator has a built-in ice maker, as well as three full-width shelves, crisper bins, a dairy bin, adjustable door storage, and more. It's Energy Star-certified, and reviewers say it looks sleek and modern in their kitchens. Many love how spacious the interior is, noting all the shelves are incredibly deep, allowing you to store much more than a side-by-side fridge would. Many appliances today are designed to use less electricity, and such is the case with the GE 17.5 cu. ft. Top Freezer Refrigerator. This Energy Star-certified refrigerator will help you save money year round by using less electricity, and it still provides all the features you’re looking for in a fridge. This appliance is 28” x 67" x 32.5”, with a 17.5 cubic foot capacity. It has a sleek modern design with a factory-installed ice maker, as well as ample storage options—there are spill-proof glass shelves, crisper drawers, in-door can storage, and more. Reviewers say this is one of the best refrigerators they've ever had, especially considering the reasonable price. Many note that while it is on the basic side, this fridge is incredibly spacious and the interior is intuitively designed for easy use. Whirlpool refrigerators have some of the most helpful food storage features, allowing you to efficiently organize all of your groceries. One of the best refrigerators for food storage is the Whirlpool 19.2 Cu. Ft. Top-Freezer Refrigerator, which comes with many adjustable drawers and shelves and is incredibly spacious, to boot. This refrigerator measures 30” x 66" x 34.5” and has a capacity of more than 19 cubic feet. For food storage, this appliance features wall-to-wall frameless shelves, two crisper drawers, adjustable door bins, and a Flexi-slide bin. Plus, the freezer also has a full-width shelf that's wide enough to let you store frozen pizzas, sheet pans, and more. Reviewers say this is a wonderful no-frills refrigerator, and many appreciate the versatility of all the various storage options. If your refrigerator space is in-between your kitchen counters, you may want a counter-depth appliance that will seamlessly blend into your counters and cabinets. For instance, the LG Electronics 11.1 cu. ft. Top Freezer Refrigerator is only 26” deep, allowing it to sit flush with standard counters and cabinets. This appliance is 24” wide and 66.5” tall with an 11 cubic foot capacity. It features a full-width pantry drawer, humidity-controlled crisper, LED lights, and a low decibel operation. Reviewers say that although it's not the most spacious model on the market, it's aesthetically pleasing, affordably priced, and meets customers needs. If you have a cramped kitchen or are looking for a refrigerator for a rental home, small apartment, or break room, then you might want a compact model like the Haier 11.6 Cu. Ft. Top-Freezer Refrigerator. This appliance has all the features you need, including the designated top-mounted freezer space, but it's significantly smaller than other models. This product is just 24” x 60" x 23” and has a total capacity of 11.6 cubic feet. Despite its reduced size, it still includes two full-width door bins, glass shelves, crisper drawers, and a clear drawer to help you store all your groceries. Additionally, you can adjust the doors to swing left or right, which helps to accommodate tight spaces. Reviewers agree that if you're looking for a small refrigerator for your space, this model is one of the best units money can buy. 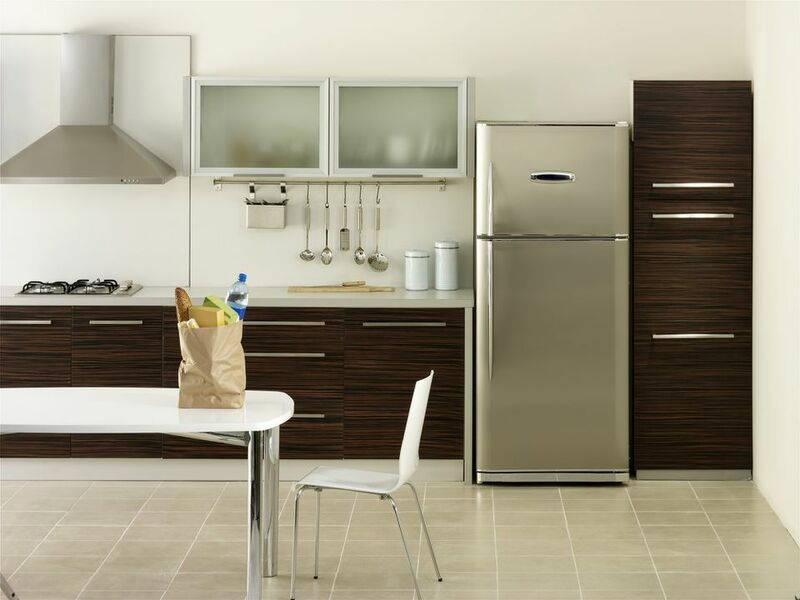 Looking for a refrigerator and freezer to put in your garage? Whether you just want extra storage space or are trying to deck out your workshop, the affordable Magic Chef 4.5 cu. ft. Double Door Mini Refrigerator is the way to go. This appliance measures 19” x 45" x 19” and has a 4.5 cubic foot capacity. It has designated fridge and freezer space and includes all the same features of a full-size fridge, such as vegetable crisper drawers, full-width shelves, door bins, and more. This mini fridge is Energy Star certified, and reviewers agree it's perfect for a second fridge in the garage or other small space.